Holokit and Aryzon are both cardboard devices created and being promoted as cheap alternatives to pricier, higher-end AR or MR. Similar in design and functionality some people say they’re actually the same thing just upside down. If you are just getting started in the world of AR or MR these cardboard options are great but if you are looking for something more advanced you may have to spend more money and get devices like magic leap (once is released) or Microsoft’s Hololens. Launched by Amber Garage, a Silicon Valley-based creative art & tech studio, the Toolkit is a low-cost solution for mixed reality experiences. It includes the Headkit headset and the TrackKit software. HoloKit features super sharp optics quality and a 76-degree diagonal field of view. Pairing with a smartphone, HoloKit can perform an inside-out tracking function, which uses the changing perspective on the outside world to note changes in its own position. HoloKit merges the real and the virtual in a smart way. While you see through the real world, virtual objects are blended into it. Powered by the accurate gyro and camera on smartphones, HoloKit solidly places virtual objects onto your table or floor, as if they were physically there without physical makers. These virtual objects will stay in the same place even if you walk away, just like real physical objects. HoloKit is different from screen-based AR experience like Tango. You can directly see through the headset and view the real world as is, and in the meantime, the virtual objects are projected on top of the real world, as opposed to viewing both the real and the virtual through a smartphone camera. 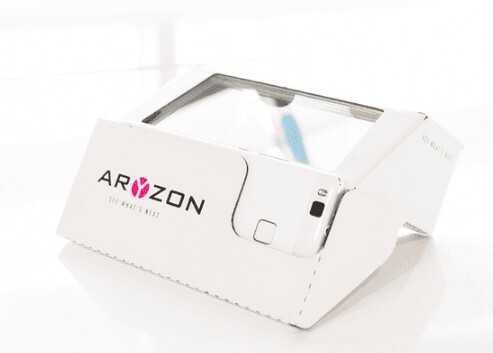 A successfully funded Kickstarter product, the Aryzon headset uses a combination of mirror and stereoscopic lens in conjunction with your smartphone’s display to show you projected objects from any angle through a combiner glass panel. The camera recognizes a marker object or scans your environment (ARKit/ARCore). Your smartphone makes a virtual map of its environment and calculates where, precisely, the holographic object should be positioned. Thus rendering a stereoscopic image, which is reflected onto the visor through a set of high-quality Fresnel lenses. When you look through the Aryzon headset, you will see a vivid, holographic, 3D image in your real-world environment. All the funded headsets sold via kickstarter have been delivered, for now there aren’t any headsets available for sale. Recently at the 2018 CES the company presented the Aryzon 2.0 and the 3D Model Viewer App which enables your 3D digital content into AR . Aryzon is also currently negotiating a partnership with VR Owl (NL) & DodocaseVR (US) to broaden our retailer network & branded headset availability. We can’t tell you which one is better yet, we want to be fair. For this article, we wanted to test both devices and give you a detailed review after actually each product, however, the Aryzon glasses are not available, according to their website they’re out of stock. With no information on when they will have more devices available for sale. The Holokit is currently available for sale at a price of $36.99 USD. You can buy the Holokit here. Stay tuned for the part 2 of this series, hopefully we can get a hold of a set of Aryzon AR glasses. Don’t forget to follow us on Facebook, Twitter or Instagram.